Heat oven to 350ºF (325ºF for dark or nonstick pan). Grease bottom only of 13x9-inch pan with shortening or nonstick cooking spray. In medium bowl, stir brownie mixes, water, oil and eggs until well blended. Stir coffee granules into batter. Spread in pan. Bake 28 to 30 minutes or until toothpick inserted 2 inches from side of pan comes out almost clean. Cool completely, about 1 hour 30 minutes. Cut brownies into 1-inch squares. In bottom of 3-quart glass bowl, place half of the brownie squares. Make pudding mix as directed on box for pudding, using milk. 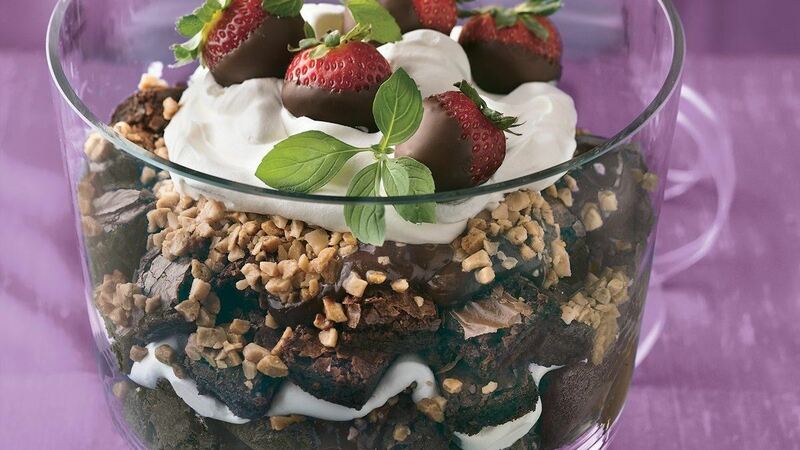 Pour half of the pudding over brownies in bowl. Top with half each of the toffee bits and whipped topping. Repeat with remaining brownies, pudding, toffee bits and whipped topping. Cover; refrigerate at least 4 hours before serving. Store covered in refrigerator. Tip: Garnish with fresh mint sprigs. Tip: Trifles hail from England. They were originally made with cake or ladyfingers covered with jam and custard, and topped with whipped cream.